Who are the main characters of Genesis? If you were to ask yourself who the main characters of Genesis are, Adam & Eve, Noah, or Cain & Abel might jump to mind. But who does the first book of the Bible really talk about the most? Hint: none of those five are even in the top ten! I took a look at how many times each person in Genesis is mentioned by name. Sometimes characters are called by several different names, and I joined those counts together. For those who are curious, I also added what each name means. A few of the results surprised me. Take a look at whose names show up the most in Genesis. Jacob had twelve sons—two of them by his wife Rachel. Rachel’s second son, and Jacob’s youngest, Benjamin, is mentioned 69 times in Genesis: once by another name. Benjamin comes up a lot during the famine, when Jacob sends his sons to Egypt to find food. Unbeknownst to Jacob’s sons, the Egyptian ruler they end up dealing with is Joseph, their long-lost brother whom they sold into slavery. Joseph puts them through some odd situations, several specifically pinpointing Benjamin. You can read the whole story in chapters 42–50. Wait, who? This guy (or these guys) gets mentioned 72 times in Genesis, yet at first glance, you might not even recognize his name. You may remember him from the story when Abraham pretends his wife is just his sister when entering the land Gerar, ruled by king Abimelech (Gen 20:1–18). Abimelech finds Sarah attractive and brings her home with him. That night, God warns him in a dream that Sarah is spoken for. Later, Abraham’s son Isaac comes to Gerar and makes the same mistake as his father by pretending his wife, Rebeka, is just his sister. This time, the king catches Isaac caressing Rebeka, which reveals the lie (Gen 26:8). Because Abimelech means “son of the king,” it’s possible that the Abimelech mentioned in the Isaac passage is the other Abimelech’s son, and not the same man. In Genesis, you’ll read the story of Esau selling his birthright to his brother for a bowl of stew (Gen 25:29–34). You’ll also read the suspenseful reunion of the two brothers years after their father dies and they’ve gone their separate ways. After much trepidation on Jacob’s part, he and Esau finally meet with an embrace (Gen 33:1–16). Jacob’s and Esau’s father, and the only son of Abraham’s wife Sarah, is mentioned 80 times in Genesis. His name means “laughter,” originating from the time that Sarah, beyond childbearing age, is told she’ll have a son—and laughs about the absurdity of it (Gen 21:6). Genesis tells the dramatic story of when young Isaac goes with his father to sacrifice to God, only to find out he’s meant to be the sacrifice (Gen 22:1–18). You’ll also read about Isaac being tricked on his deathbed. His wife and son take advantage of Isaac’s blindness in his old age, and deceive him into giving the birthright blessing to Jacob instead of Esau (Gen 27:1–29). Genesis mentions Abraham’s wife 102 times. 34 of those times are by her old name, Sarai, which means “princess.” She gets a name change in Genesis 17:15. We know that Sarah is good-looking enough for Abraham to be afraid that important people would kill him to have her for themselves (Gen 12:11–14). We also know that she is barren. To make up for this, she gives Abraham her Egyptian maid, Hagar, to bear him children on Sarah’s behalf. Hagar ends up conceiving, and this causes some serious relational discord between the two women. (Gen 16:1–16). We also read about Sarah laughing to herself when she hears the mysterious visitors telling Abraham she’ll have a child. She must have been embarrassed about it, because she denies having laughed (Gen 18:9–15). Of course, this denial doesn’t last when her son is born: she names him for that very laughter. When Jacob falls in love with Laban’s younger daughter, Rachel, Laban agrees to give her to his nephew after seven years of work. Seven years and a wedding later, Jacob realizes his uncle tricked him into marrying his older daughter, Leah, instead. Laban requires seven more years from Jacob in order for him to marry the daughter he really wanted (Gen 29:16–30). Laban and Jacob’s relationship seems to have gone downhill for a while (read about it in chapters 30 and 31), until finally they make a covenant to refrain from harming each other, and part ways (Gen 31:40­­–55). Genesis documents the name of God several ways throughout the book, a total of 201 times. The most common of these is translated “Lord” in most Bibles, which comes from the Hebrew YHWH (“Yahweh”). This comes up 178 times in Genesis. God comes up by name 23 other times in Genesis, but by many different names. Since several of these are often translated as “God” in most English Bibles, you might not notice all the different names when you’re reading. El, sometimes used for other gods. It simply means god, or hero. Joseph the dreamer, known for his fancy coat, comes up 313 times in Genesis. His name essentially means “he takes away; he shall add.” Fitting, considering the events of Joseph’s life. Joseph is his father’s favorite, which rubs his brothers the wrong way. When Joseph tells them his dreams, they get even angrier with him (Gen 37:2–8). Eventually, Joseph’s brothers betray him, sell him into slavery, and lie about it to their father, Jacob (Gen 37:18–35). To make a long story short, Joseph goes from slave to Pharoah’s right-hand guy. Eventually, his brothers come to him during a famine. He finally reveals himself to them and forgives them (chapters 39–45). He tricked his older brother, Esau, into giving him his birthright (Gen 25:29–34). He and his mother tricked Isaac into giving him the blessing meant for the eldest son (Gen 27:1–29). He himself was tricked by his uncle, Laban, into marrying the wrong daughter (Gen 29:21­–27) . He was tricked by his own sons into believing Joseph, his favorite, was killed by a wild animal (Gen 37:31­–33). At the end of his life, Jacob and 70 of his descendents move to Egypt to be with Joseph. Several generations after he dies, the Egyptians enslave the Israelites. God calls him to leave his home and go to a new land (Gen 12:1–3). God makes a covenant with him, which kicks the entire narrative of the nation of Israel into gear. He promises to bless Abraham, and to make his offspring a blessing (Gen 15:1-21). After these promises, Abraham and Sarah struggle to have a child. It’s not until his wife is well past childbearing age that she finally, miraculously, gets pregnant with their son, Isaac. God tells Abraham to sacrifice Isaac—at the time, his only legitimate child—as an offering to him. Abraham shows great faith by acting on these instructions, and God intervenes at the last moment to spare Isaac from death (Gen 22:1–18). God keeps his promise: Abraham’s grandson (and Isaac’s son) Jacob, becomes the father of the nation of Israel. 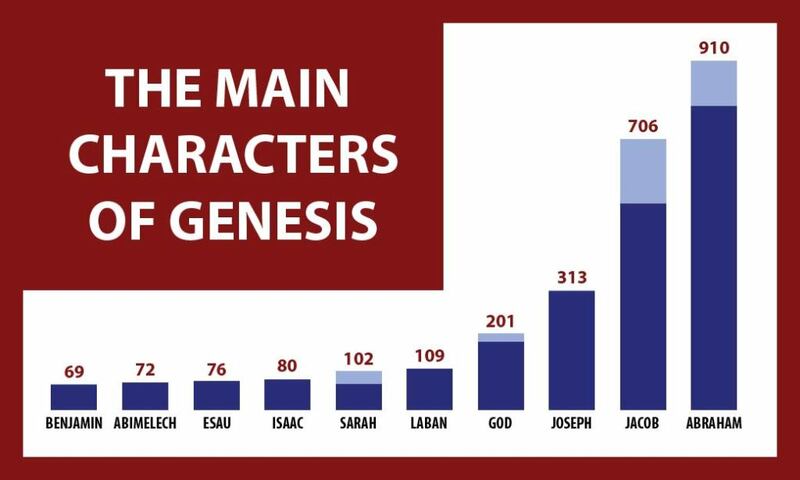 So there you have it: these ten characters were mentioned more than any others in the book of Genesis. Want to learn more about Genesis? Jeffrey’s written a helpful overview on the book, which you can find here. Amazingly geeky and informative. This is great! That is really cool, but I would argue that Jesus is the main character in Genesis (and every book of the Bible). :) Thanks for the awesome post! You are wrong, better to study the text before you make a comment. 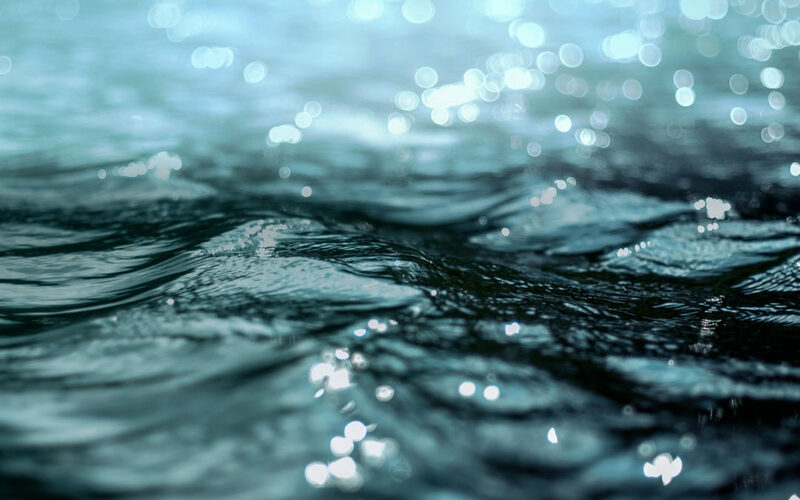 How is Jesus revealed from Genesis to Revelation? Good question, Eric. I actually compiled every mention of every name in the original language using Logos Bible Software’s data sets, and added them up. Good question, Eric. I actually added up all the mentions of each and every name in Genesis using Logos Bible Software’s original languages data sets. Then I merged the names that I knew corresponded to the same people (e.g. Sarai + Sarah, Abram + Abraham). Excellent piece. Thanks for taking the trouble. main character is different than most mentioned. Which is what this article about. But I agree the whole bible’s main theme is all leading up to Jesus starting with “in the beginning the word…”. Interesting study, thanks. I’m probably being dense but cannot see how you came up with these numbers. For example, when I search against ‘Benjamin’ using the Strongs number ‘H1144’ in Genesis it returns 16 results. Can you elaborate?